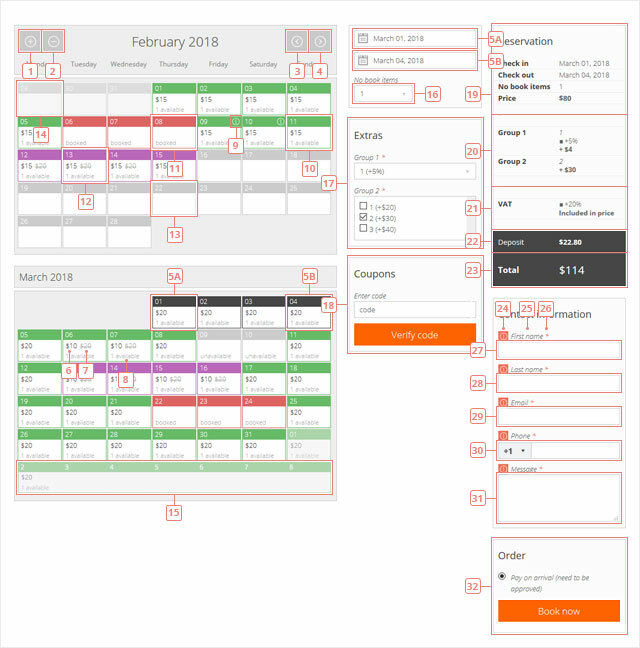 The idea behind the front end booking calendar is that your clients send a booking request with just a few clicks. They can view the availability, select the reservation period, add services, coupons and add their contact details without changing the page. Button 1 - Click to add an extra month when you view the availability in the calendar. Button 2 - Click to remove the last month from the booking calendar view. Button 4 - Click to display next month(s). Item 5A - Selected the start date of your reservation. The reservation period can be selected directly in calendar view or the sidebar. Item 5B - Select the end date of your reservation. The reservation period can be selected from the calendar view or the sidebar. Item 6 - Price or promotional price details, with currency. The currency can be changed and it can be displayed in the front or after the value. Item 7 - Old price info. It is displayed only when a promotional price is created. Item 8 - Information about the number of available items in that day, or day status (available, booked, special, unavailable). Item 9 - Information about the day, which was filled in by the administrator. Item 10 - Day with available status. Color can be changed in template CSS file. Item 11 - Day with booked status. Color can be changed in template CSS file. Item 12 - Day with special status. Color can be changed in template CSS file. Item 13 - Day with unavailable status. Color can be changed in template CSS file. Item 14 - Previous month day(s), or day(s) that have passed. To properly separate this day(s), we reduced the opacity. Item 15 - Next month day(s). To properly separate this day(s), we reduced the opacity. Item 5A & 5B - The selected period for which you want to make a reservation. If you do not want to view availability, directly select the dates and booking system will inform you if the days are available and can be booked, or not. Item 16 - Select the number of items to book. Item 17 - Select extras & services you want to add to your reservation. Item 18 - Enter your voucher code, validate it and then apply it, if you want to use it with your reservation. Item 19 - Main reservation details are displayed here, as start date (hour), end date (hour), number of booked items and price. Item 20 - A list of extras & services you want to add to your booking request and how they influence your main reservation price. Item 21 - A list of taxes & fees that are applied to your booking request and how they influence your main reservation price. Item 22 - If a deposit is requested to make a booking, the value of that deposit is displayed here. Item 23 - Total cost for the reservation. Item 24 - Error message - if the field is mandatory and has not been completed. Item 25 - Form field label. Item 26 - Indicate that the field is mandatory. Item 27 - Text input field. Item 28 - Text input field. Item 29 - Email input field, always mandatory. Item 30 - Phone input field. Accepts only numbers. Item 31 - Textarea input field. Item 32 - Select the payment option and press the Book now button to finalize the reservation.